"A child has formed 80% of his / her personality by the age of three years old." This statement has haunted me from the day I heard it. If it were true, the experiences and relationships my child has will be the basis of his entire life - that's not to be taken lightly. I investigated further, and yes an infant's brain grows to 80% of adult size by three years of age, and 90% by age five. An infant experiences a massive burst of brain formation known as the 'exuberant period', at its peak creating an astonishing two million new synapses every second. Connections that are used frequently become permanent, those that are neglected die off. This is where experience is vital in wiring an infants brain - experiences of neglect and abuse literally cause genetically normal children to become mentally retarded. Children who are malnourished throughout this period do not adequately grow, either physically or mentally. Parents who are preoccupied, who do not have the resources, information, or time, may not provide the stimulating experiences needed for infant brain development. For instance infants and children who are rarely spoken to, exposed to few toys, and have little opportunity to explore and experiment with their environment, may fail to fully develop the neural connections. Infants whose mothers frequently speak to them learn almost 300 more words by age 2 than their peers whose mothers rarely speak to them. Mere exposure to language such as listening to the television or to adults talking amongst themselves provides little benefit. Rather infants need to interact directly with other human beings, to hear people talking about what they are seeing and experiencing, in order for them to develop optimal language skills. Unfortunately, many parents are under the mistaken impression that talking to babies is not very important because they are too young to understand what is being said. 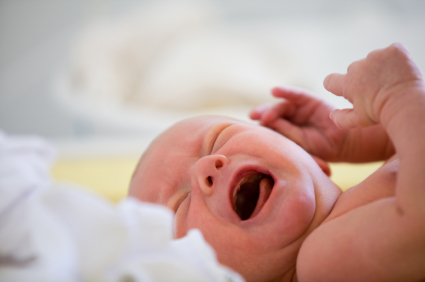 Chronic stress in an infant, such as that seen in cry-it-out techniques, causes inhibited nerve tissue development in the brain, growth suppression, and immune system depression. Regions of the brain are altered similar to that seen in adults with depression. Infants who experience persistent crying episodes are 10 times more likely to have ADHD, poor school performance, poor fine motor development and antisocial behaviour. Such a child may display increased aggression, impulsivity, emotional unattachment, and violence later in life due to an overactive adrenal system. The sensitivity and responsiveness of a parent stimulates and shapes sections of the brain responsible for attachment and emotional well-being. It's been noted the single most important influence of a child’s intellectual development is the responsiveness of the mother to the cues of her child. Show love and affection, respond to your babies cries without hesitation. Talk to your baby often with a kind voice, a wide range of vocabulary, and a lot of expression, and encourage imitation. Touch your baby, researchers discovered that premature infants that were massaged grew faster, cried less, and were released earlier from the hospital than those who weren't. Let your baby experience and explore different surroundings, textures and temperatures. Read books and play music (Mozart's music has been found to stimulate the same parts of the brain that are later used for mathematics). I am reminded of these facts every time I interact with my child. Regardless of my own hard wiring, I want better for my children than what I had. I don't want my children to end up with all my problems, I want to provide them with better opportunities, and more positive and stimulating environment. And that's where parenthood truly benefits your life as a parent - you are forced to challenge your own hard wiring, to learn and better yourself, so your child can have a more learned and better life. Through your love of your child, you become a better person. Mama, thanks! I found it really interesting researching for this post too. I am truly more attentive with my children after reading the info, especially with my youngest who's 20 months. Such an important time period.